2 new Finn Juhl Cheiftain Chairs. The chair are in teak and with vegetable leather. Here is the possibility to make your own patina. Price pr. pcs. : 80.000 DDK. 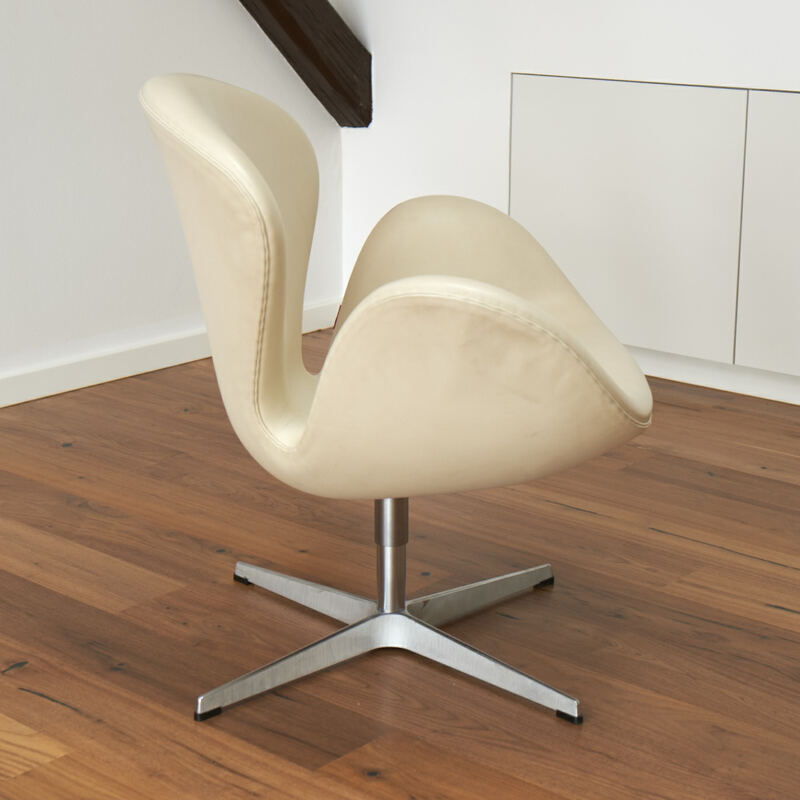 New Hans J. Wegner EJ100, Oxchair with matching stool in walnut elegance leather. 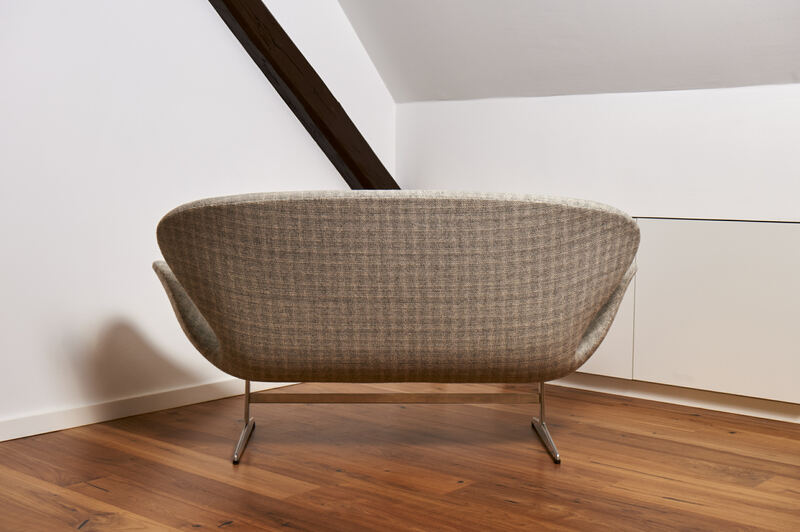 Hans J. Wegner AP27 armchair from the 1950's in light grey Hallingdal 130 wool and black Hallingdal 200 wool on the seat. 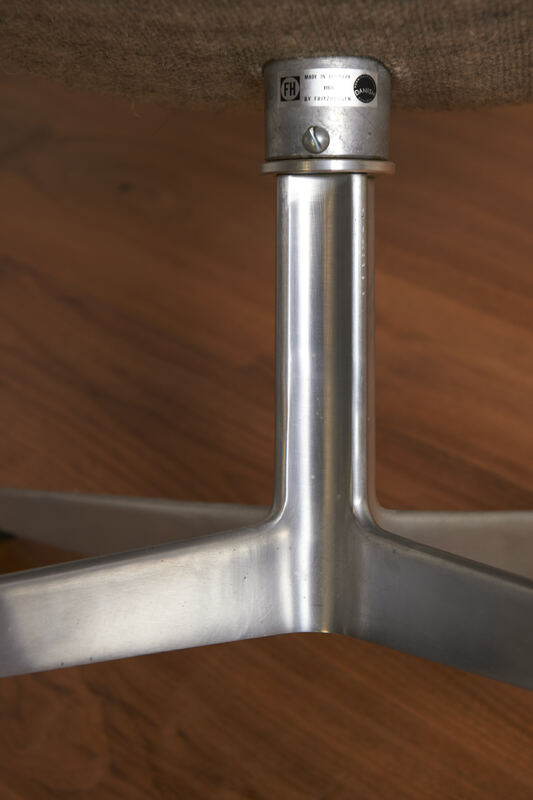 The chair is with tapered legs and arms of patinated oak - all in a very good condition with only a few signs of use. 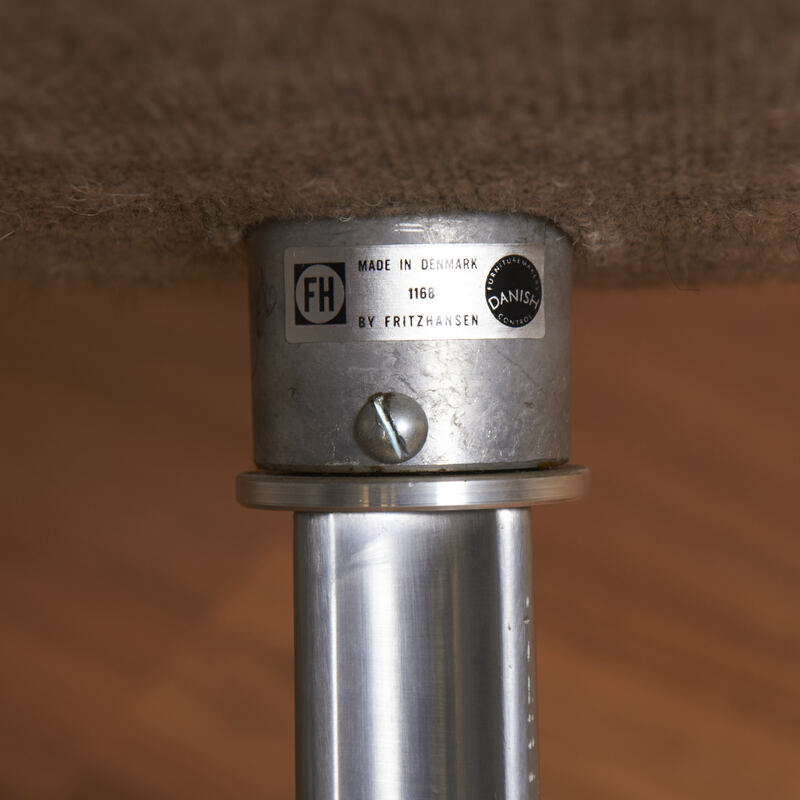 New Hans J. Wegner PP225, Flag Halyard Chair with belonging fur and pillow in vegetable leather. 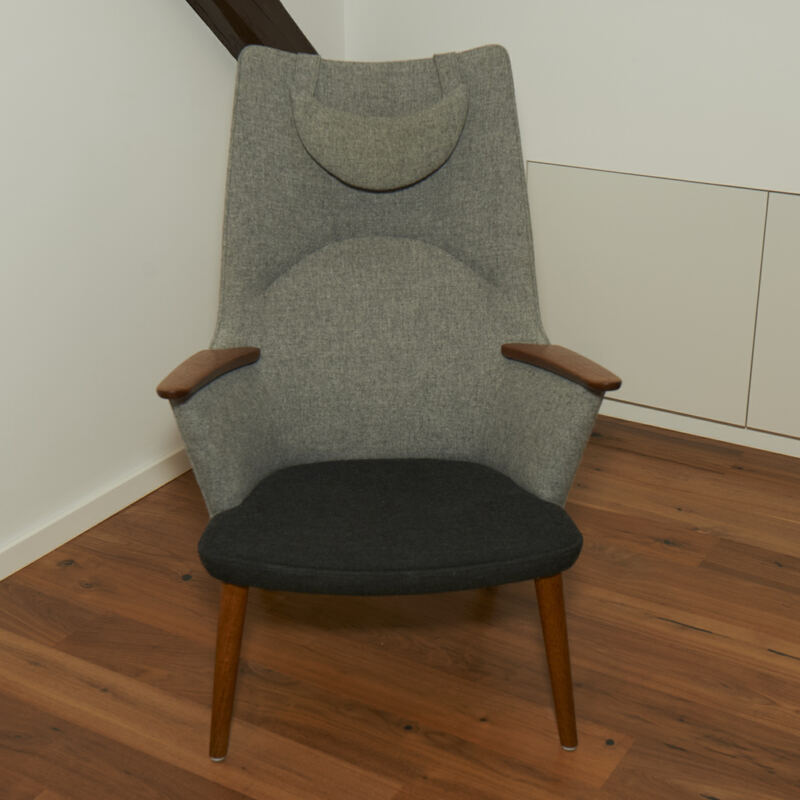 Hans J Wegner AP19 Papa Bear chair upholstered in dark grey Tonica wool, code 792. Legs and nails in teak. 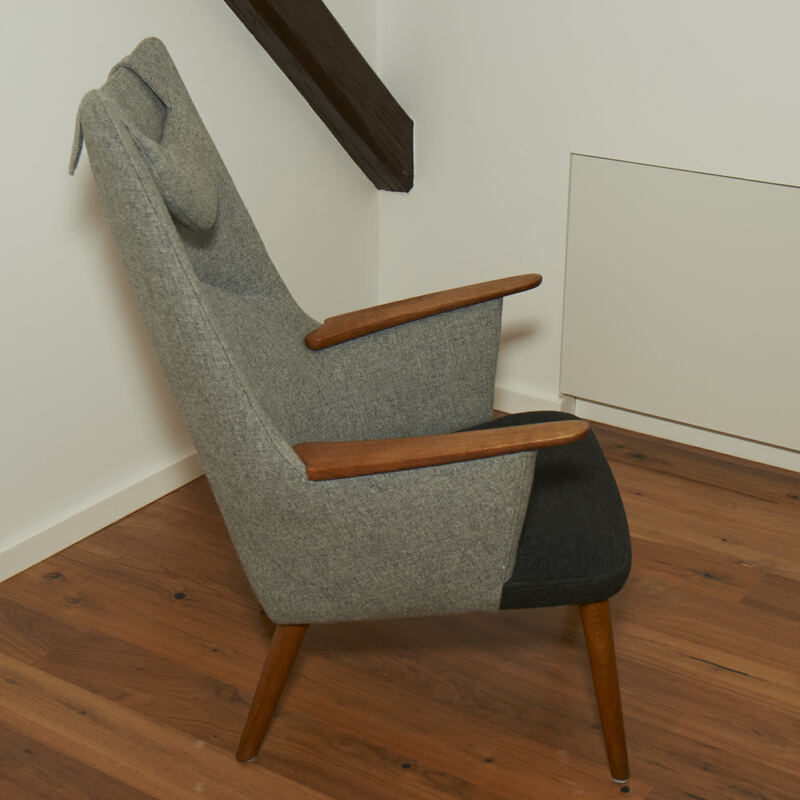 Hans J Wegner AP19 Papa Bear chair upholstered in blue Tonica wool, code 791. Legs and nails in mahogany. 2 pcs. 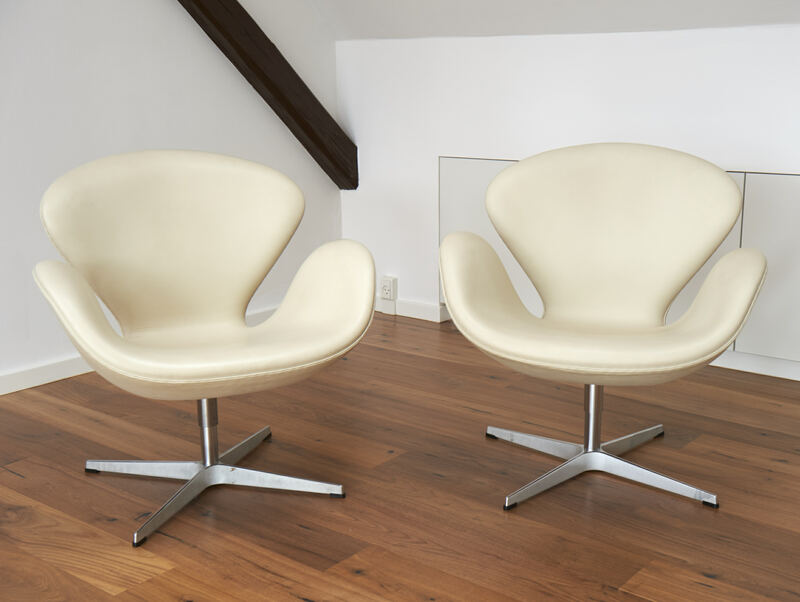 of Arne Jacobsen 3320 The Swan in creme white leather. Both chairs are in a very good condition. Price pr. pcs. : 25.000 DDK. Original no. certificate is included. 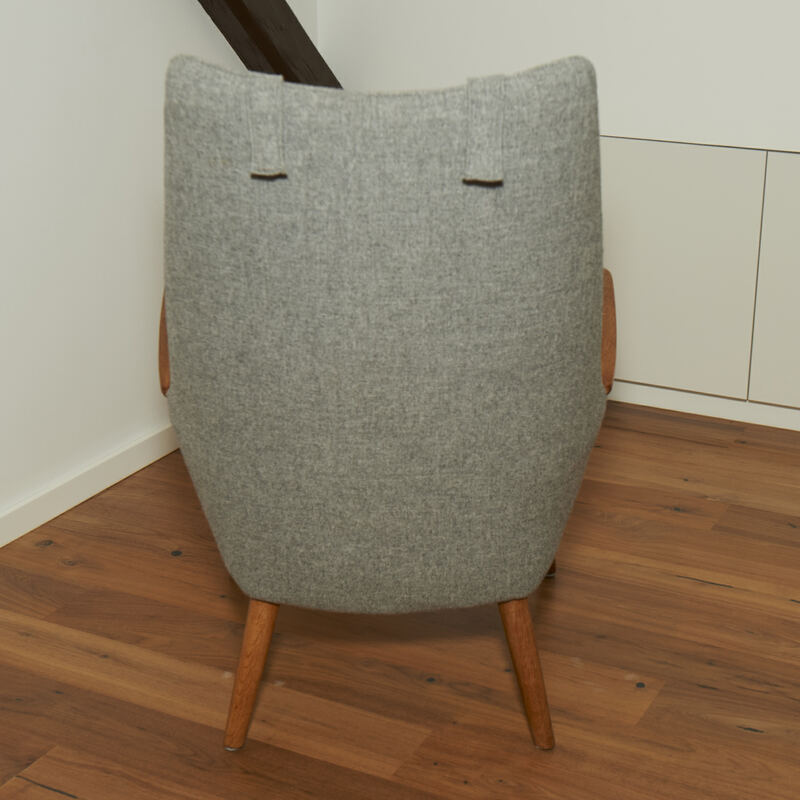 New Erik Jørgensen EJ5 Corona chair, model Spectrum in dark grey Hallingdal wood, code 180. 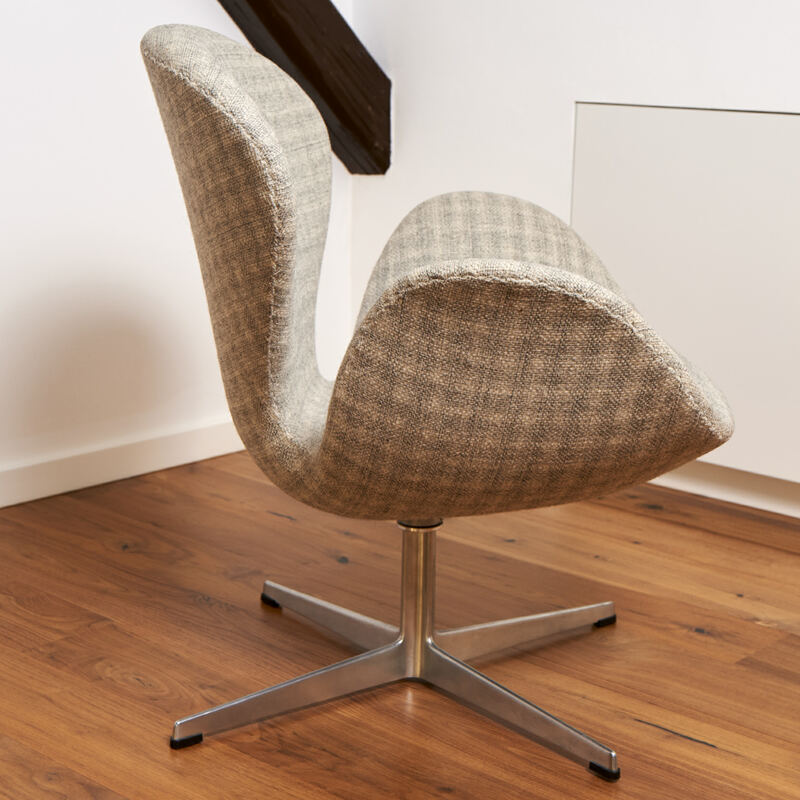 Hans J Wegner AP19 Papa Bear chair in light grey Divina wool, code 120 and with buttons and chains in nature leather. Legs and nails in beech. 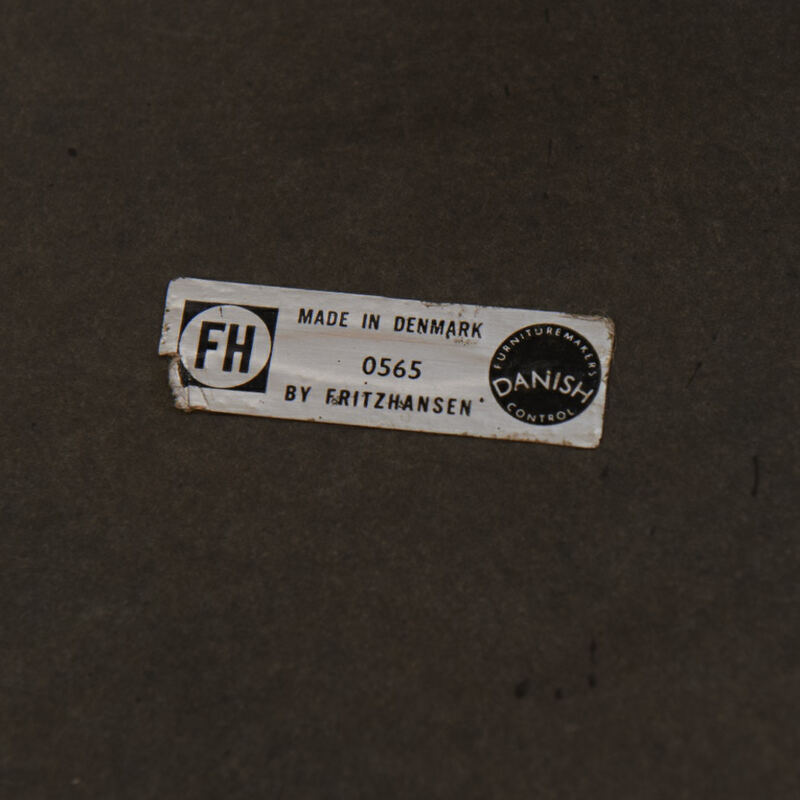 A very rare example of Arne Jacobsens Egg in original condition from 1965. 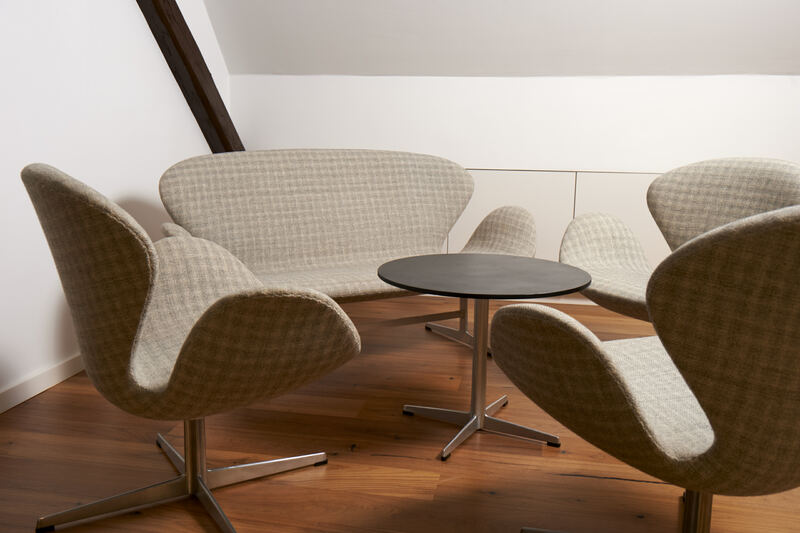 The Egg chair is labelled "0865" which indicate that they are from August 1965. There is no sign of cracks or dried leather and it has a beautiful patina. 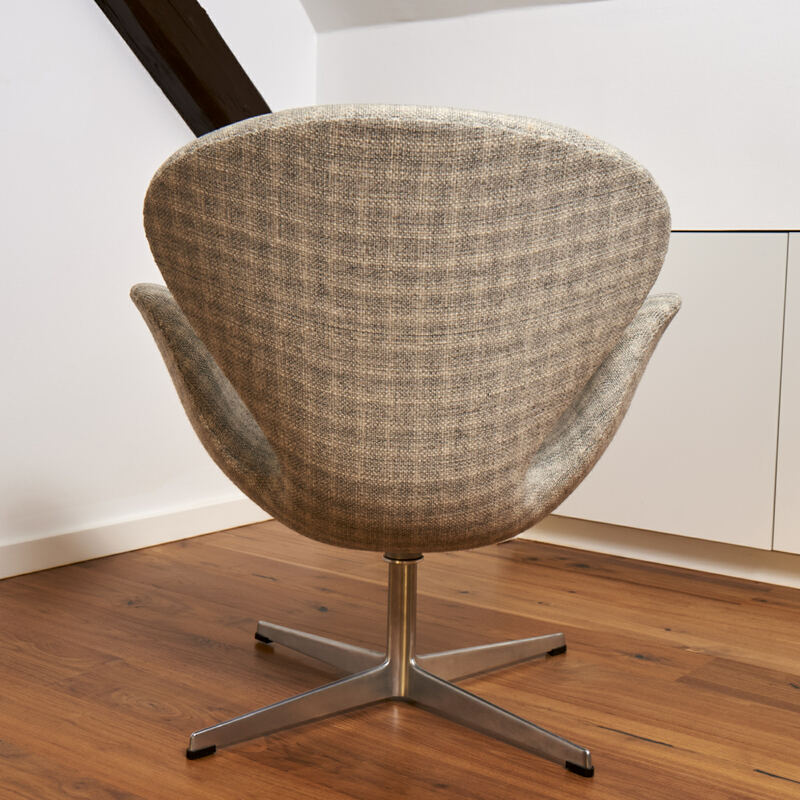 The PP130 Circle chair by Hans J. Wegner in oak and with dark grey Hallingdal wool, code 180. 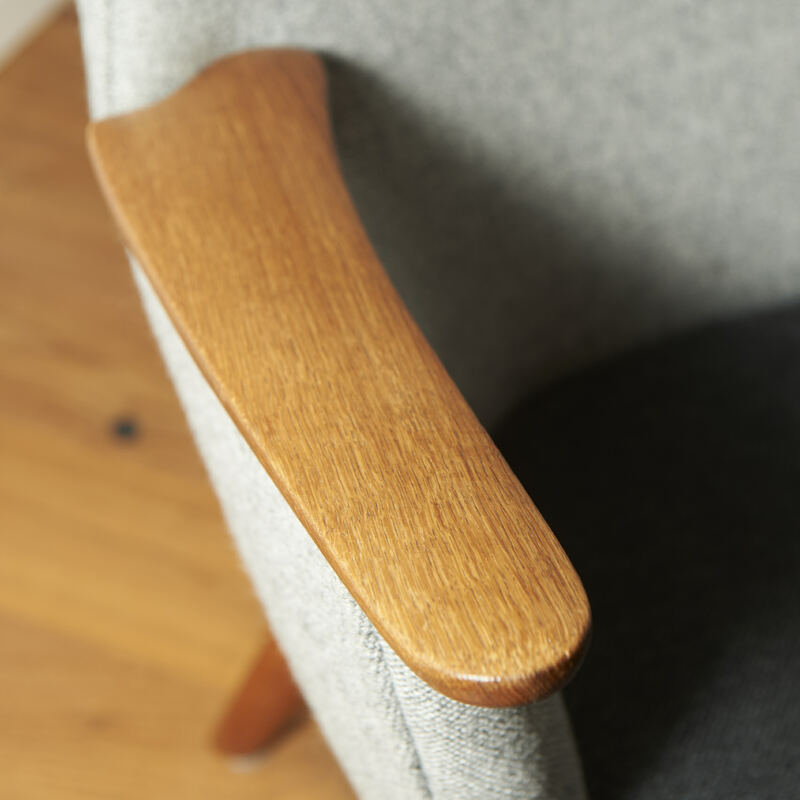 New Børge Mogensen The Spanich chair in soaped oak and natural leather. 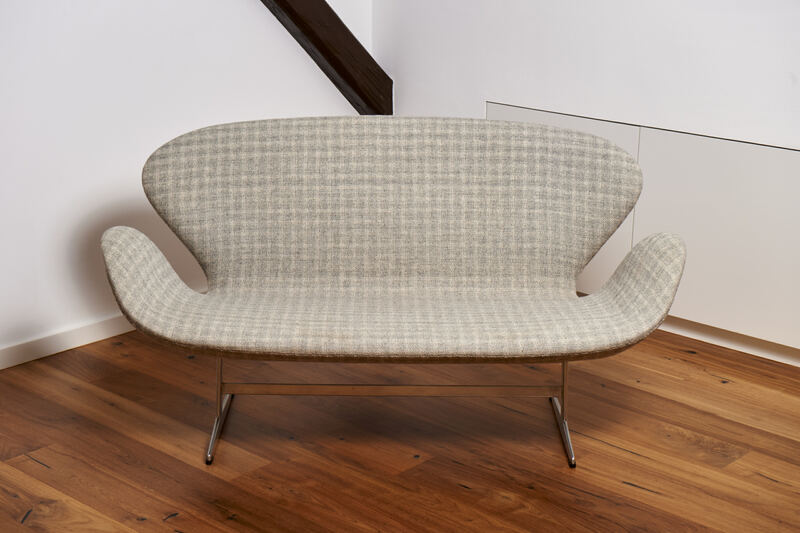 Hans J Wegner AP19 Papa Bear chair upholstered in black Hallingdal wool, code 200. 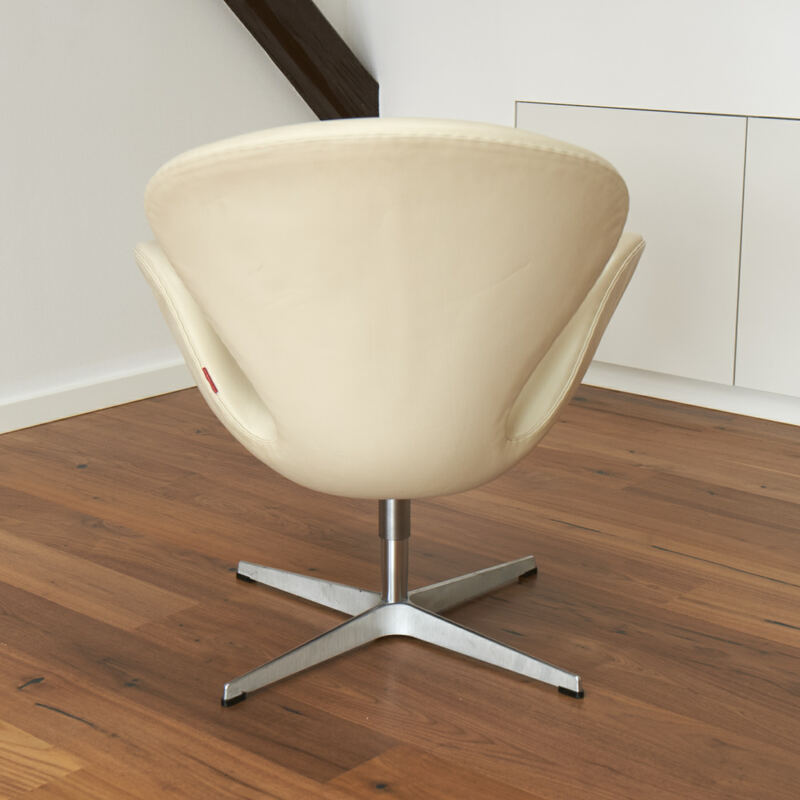 Erik Jørgensen EJ5 Corona chair and stool in red elegance leather. The chair is in a very good condition. Price incl. stool: 38.000 DDK. 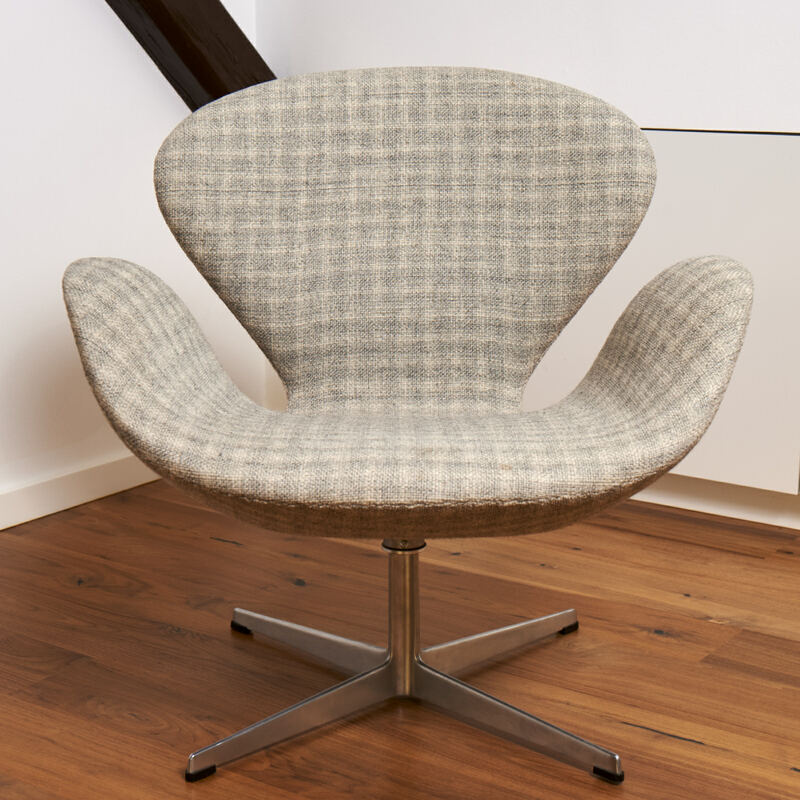 An original Hans J. Wegner Peacock chair from the 1970's by Johannes Hansen. The Peacock is in oak and with arms of teak. The seat is of papercord. 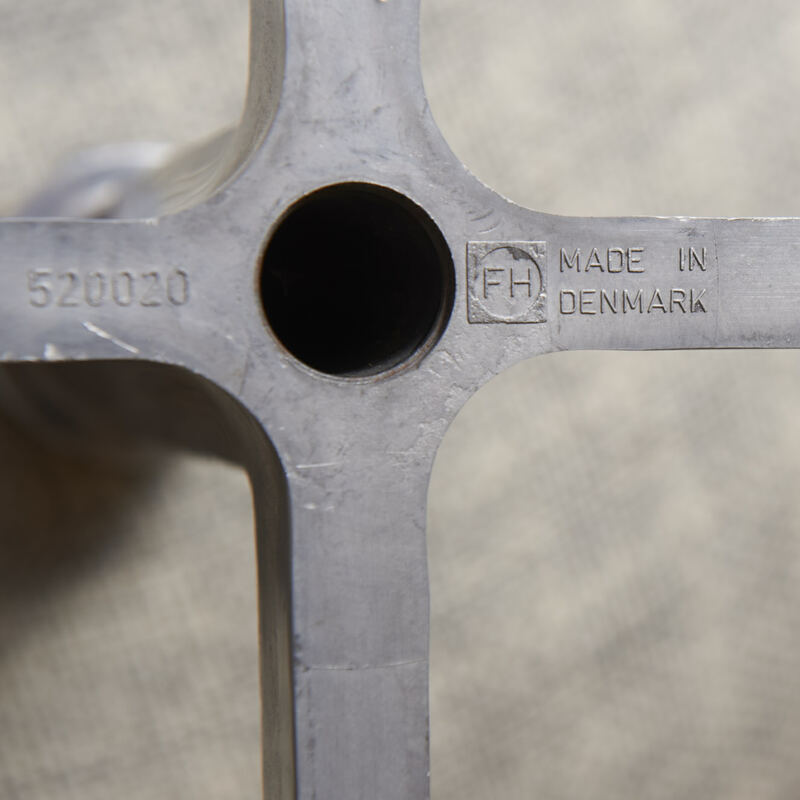 Old model of Børge Mogensens The Spanish chair. 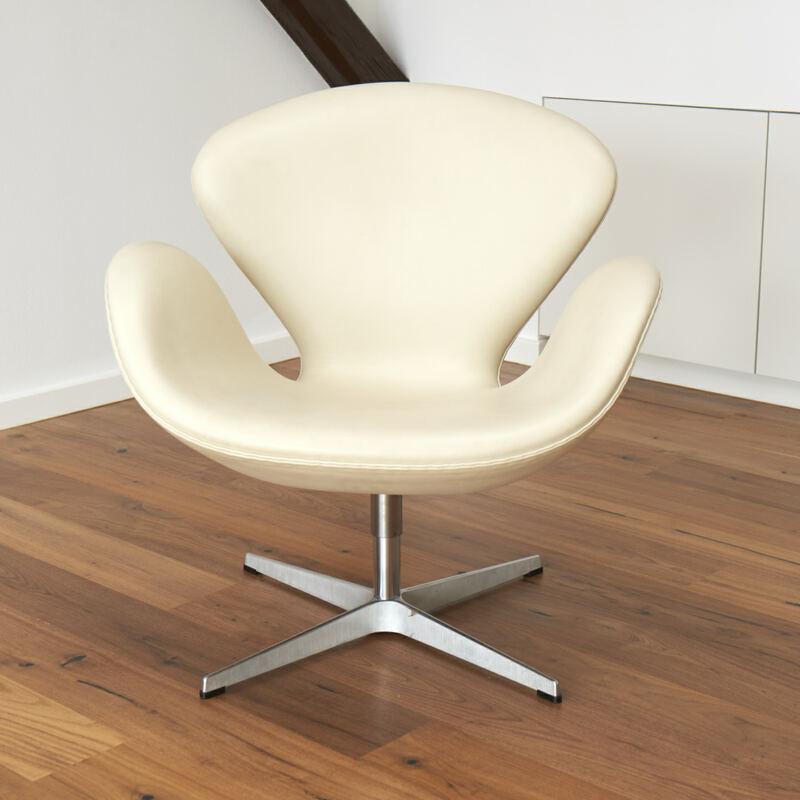 The chair is from the 1960's and it is with original natural leather and frames of oak. Two pcs. 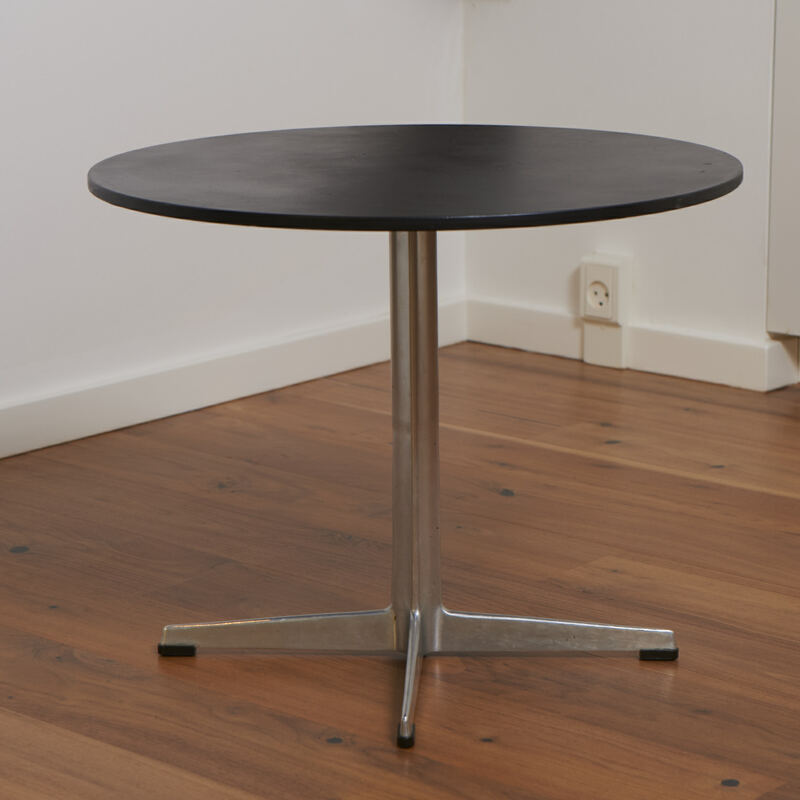 of the anniversary model of Arne Jacobsen 3120 The Swan from 2008. The chairs is in white leather and signs of use is minimal. The serial numbers are in the ring on the food. Price pr. pcs. : 40.000 DDK. 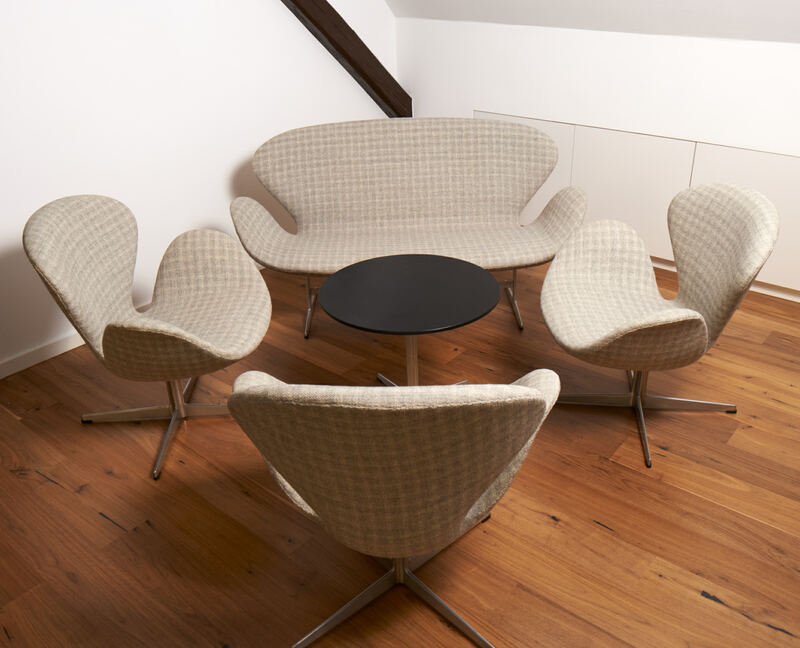 An old Arne Jacobsen Swan set with a couch, 3 chairs and a little table. 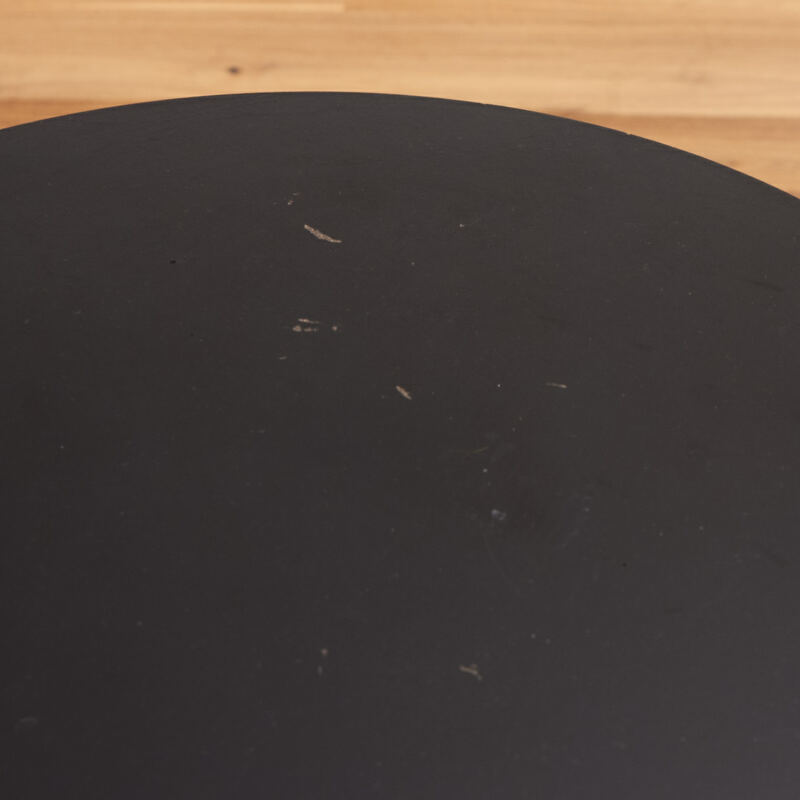 The set is original from 1968 and the table from 1965 - rarely offered for sale.